Immune cells identified as the culprit linking hypertension and dementia. Hypertension is a leading risk factor for dementia, however, the mechanisms underlying its damaging effects on the brain are poorly understood. Now, a study from researchers at Weill Cornell Medicine shows that high blood pressure transforms cells of the immune system into agents of cognitive decline. The team state that they have successfully isolated the molecular pathways by which hypertension causes immune cells known as perivascular macrophages (PVMs) to undermine the proper delivery of blood to different parts of the brain. The opensource study is published in the Journal of Clinical Investigation. Previous studies show that due to a lack of energy reserves, the brain relies on continuous delivery of blood flow to its active regions in accordance with their dynamic metabolic needs. Hypertension disrupts these vital regulatory mechanisms, leading to the neuronal dysfunction and damage underlying cognitive impairment. Elucidating the cellular bases of these impairments is essential for developing new therapies. PVMs are types of white blood cells that, as part of the immune system, kill bacteria and remove cell debris, and reside in the tissue of a number of organs including skin and the brain. The current study shows that PVMs are implicated in the deleterious effects of hypertension on the brain, and demonstrates the damaging effects of these immune cells on cerebral blood vessels. The current study uses miniature infusion pumps attached to mice to confirm a link between PVMs located in the brain-tissue side of the blood-brain barrier, and a blood-circulating hormone called angiotensin, which is implicated in human hypertension. The lab explain that angiotensin is known to impair both blood vessel dilation and the delivery of blood to stimulated areas of the brain, which over time leads to neuronal dysfunction and cognitive decline. The group administered chemically tagged angiotensin hormones into the circulating plasma and then used an electron microscope to confirm that the hormone had traversed the blood-brain barrier to engage with receptors of PVMs. Results show that when angiotensin contacted angiotensin receptors on PVMs, it activated an enzyme complex called Nox2, a major producer of highly reactive molecules called free radicals which readily incapacitate nearby cells and proteins by changing their chemical structure. Data findings show that this is damaging because nitric oxide is a signaling molecule essential in regulating cerebral blood vessel dilation; the team believe that its decrease leads to dysfunction in blood flow to the brain. Results show that after two weeks of angiotensin delivery depletion of PVMs in brain tissue actually saved mice from the neurovascular impairment normally caused by hypertension. The researchers obtained similar data by eliminating angiotensin receptors or Nox2 from PVMs using bone marrow transplantation. Data findings show that the improvement in blood flow to the brain resulting from PVMs depletion improves the cognitive dysfunction caused by hypertension. The team surmise their findings show that hypertension activates PVMs in the brain, leading to increased oxidative stress in the brain’s blood vessels that is linked to dementia. For the future, the researchers state that their work builds on other research that points to the role of the immune system in the pathogenesis of hypertension. They go on to add that how immune cells such as PVMs are activated is an area which could be explored for possible hypertension and cognitive impairment therapies. Potential mechanisms by which ANGII hypertension leads to neurovascular dysfunction underlying cognitive deficits. The left side of the figure illustrates a pial arteriole giving off a branch penetrating into the brain parenchyma and surrounded by astrocytic end-feet forming the glia limitans and by PVMs. 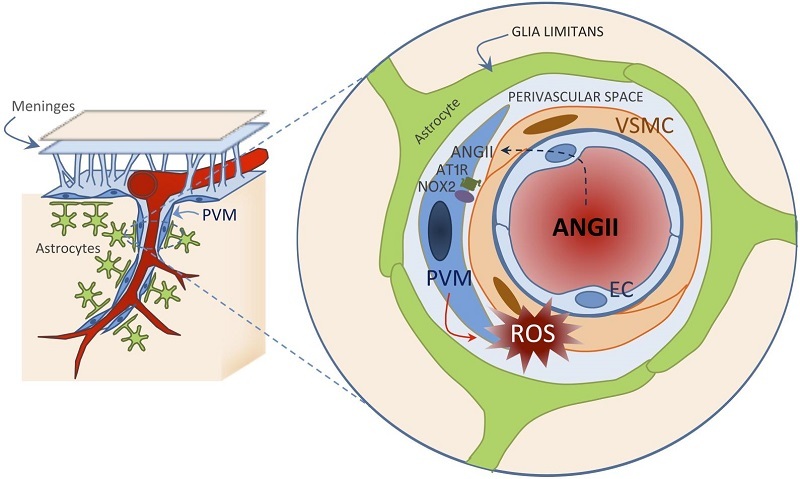 As illustrated in the enlargement on the right, circulating ANGII reaches the perivascular space through a breach of the BBB and acts on ANGII type 1 receptors (AT1R) on PVMs, resulting in the activation of NOX2 and ROS production. Oxidative stress, in turn, leads to neurovascular dysfunction. PVM, perivascular macrophage; EC, endothelial cell; VSMC, vascular smooth muscle cell. Perivascular macrophages mediate the neurovascular and cognitive dysfunction associated with hypertension. Iadecola et al 2016.